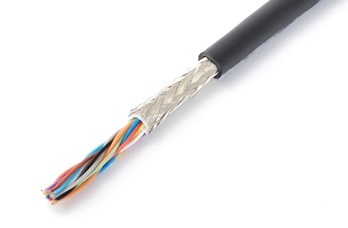 Flexible Cable - RMFEV-SB Series flexible cable with Fluororesin (ETFE) insulation, braided shield and twisted pairs. The RMFEV series high flexible cable uses 80-micron extra-fine wires for the internal conductors, and hard fluororesin (ETFE) insulation for high durability and low friction drag between insulated cores. The cable features high mechanical strength, heat resistance, and high flexibility. The cable’s sheath uses PVC for excellent flame retardancy, oil resistance, and flexibility. The RMFEV-SB has a braided shield that prevents outside electrical interference.